The Game Boy Advance was launched in 2001, but a number of different versions were released over the years, including the backlit, clamshell design of the Game Boy Advance SP, and the pocket-sized Game Boy Micro. This page covers all hardware and accessories for these systems. The Game Boy Advance used the serial code AGB (Advanced Game Boy) for its hardware. The Game Boy Advance SP used the serial code AGS (Advanced Gameboy System). The Game Boy Micro used the serial code OXY (Oxygen, as it was developed alongside the Nintendo DS whose serial code is NTR for Nitro). A 32-bit handheld videogame system, released in 2001. The original model featured the screen in the middle with the + Directional Pad and A and B buttons on either side, a Start and Select button under the + D-Pad and L and R shoulder buttons. The system didn't feature a backlight, which meant many early games were developed with bright colour palettes. The system could display a 15-bit RGB colour palette and had 8-bit DAC sound plus legacy Game Boy sounds. The system was backwards compatible with the entire Game Boy and Game Boy Color library. 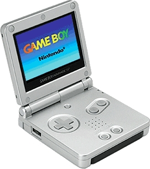 Released in February 2003, the Game Boy Advance SP was the first redesign for the Game Boy Advance. The new clamshell design reduced the size of the system to around half that of the first model when closed, as well as protecting the screen from scratches. The screen was also front-lit, overcoming many of the issues with the original model. The controls were moved to the bottom half of the system, and the game pak is inserted into the front of the system. It was also the first Game Boy to come with a rechargable lithium ion battery as standard. The system lacked a headphone jack, although an adapter was available that allowed headphones to be inserted into the EXT port. A backlit screen model of Game Boy Advance SP was released around the time of the launch of the Game Boy Micro and Nintendo DS. The system was only available for a short time. The last remodel of the Game Boy Advance line, and the final system to bear the Game Boy name. The Micro was drastically reduced in size and with a sharp, backlit screen. The system came with removable faceplates in Japan that allowed for customisation, although these were never officially made available in the US or Europe. The Game Boy Micro wasn't compatible with Game Boy or Game Boy Color games, or many accessories. The system also sold in relatively low numbers when compared to its predecessors, due to Nintendo's plan to release it alongside the Nintendo DS late in 2005. A cable that allowed two Game Boy Advance systems to communicate with each other for multiplayer gaming. Unlike the older Game Boy, this would sometimes include single-cart multiplayer, although in most cases 2 carts were still required. The Game Boy Micro used a different Game Link Cable to the Game Boy Advance and SP models, and an adapter was available. A card scanner that inserted into the Game Boy Advance cartridge slot, and allowed for special Card-e Reader cards to be scanned. The data on the cards would be read by the scanner and provided additional game data for a number of Game Boy Advance and GameCube games. A Game Boy Advance cartridge could be inserted into the space on the Card-e Reader, and the GCN-GBA Link Cable could also be used to transfer data. The Card-e Reader was renamed the Nintendo e-Reader in the US and Australia, but it never received a European release. A wireless adapter for the Game Boy Advance that fits into the EXT port (where the Link Cable attaches). 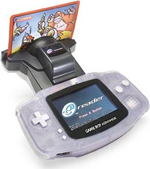 The Wireless Adapter allows for up to 5 people to play local multiplayer without cables, for up to 39 wireless adapters to communicate with each other, and for data to be sent to the Game Boy Advance during special events. However, the Wireless Adapter could only be used with compatible games, and was not backwards compatible with other link-up games. It was also incompatible with the Game Boy Micro due to a different EXT port, and a separate Wireless Adapter was made available. An Infra Red Link Adapter was also developed early in the Game Boy Advance's life, but it was only compatible with one third-party game. A media player that can read MP3 music files and MP4 video files from an SD Card using flash memory. Due to its power requirements, it was not compatible with the original model Game Boy Advance. It was also possible to download a number of minigames from Nintendo's website which could be added to an SD Card and played on the Play-Yan. The original model was discontinued after just 7 months, and a second model was released 2 days after the discontinuation. The Play-Yan Micro featured a new user interface and the ability to play MP4 files directly from the device. It also removed the ability to play games. A version was released in Europe as the Nintendo MP3 Player. While similar to the Play-Yan Micro, it was stripped of all movie playback capabilities, only being compatible with MP3 music files.